A Thermal mass flow meter measures gas mass flow rate based on the conventive heat transfer of a heated surface to the flowing fluid. Mass flow measurement is the basis of most recipe formulations, material balance determinations, and billing and custody transfer operations throughout industry. With these being the most critical flow measurements in a processing plant, the reliability and accuracy of mass flow detection is very important. 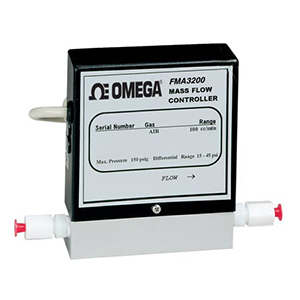 In the past, mass flow was often calculated from the outputs of a volumetric flowmeter and a densitometer. Density was either directly measured, or was calculated using the outputs of process temperature and pressure transmitters. These mass flow measurements were not very accurate, because the relationship between process pressure or temperature and density are not always precisely known--each sensor adds its own separate error to the overall measurement error, and the speed of response of such calculations is usually not sufficient to detect step changes in flow. Thermal mass flow meters are often used in monitoring or controlling mass-related processes such as chemical reactions that depend on the relative masses of unreacted ingredients. In detecting the mass flow of compressible vapors and gases, the measurement is unaffected by changes in pressure and/or temperature. 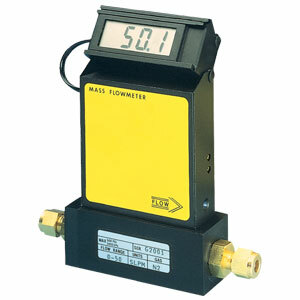 One of the capabilities of thermal mass flow meters is to accurately measure low gas flow rates or low gas velocities (under 25 ft. per minute)--much lower than can be detected with any other device. Thermal flowmeters provide high rangeability (10:1 to 100:1) if they are operated in constant-temperature-difference mode. On the other hand, if heat input is constant, the ability to detect very small temperature differences is limited and both precision and rangeability drop off. At normal flows, measurement errors are usually in the 1-2% full scale range. This sensor is available in high pressure and high temperature designs, and in special materials including glass, Monel, and PFA. Flow-through designs are used to measure small flows of pure substances (heat capacity is constant if a gas is pure), while bypass and probe-type designs can detect large flows in ducts, flare stacks, and dryers. Thermal mass flow meters are most often used for the regulation of low gas flows. They operate either by introducing a known amount of heat into the flowing stream and measuring an associated temperature change, or by maintaining a probe at a constant temperature and measuring the energy required to do so. The components of a basic thermal mass flow meter include two temperature sensors and an electric heater between them. The heater can protrude into the fluid stream or can be external to the pipe. In the direct-heat version, a fixed amount of heat (q) is added by an electric heater. As the process fluid flows through the pipe, resistance temperature detectors (RTDs) measure the temperature rise, while the amount of electric heat introduced is held constant. Thermal mass flow meters can have very high rangeability and reasonable accuracy, but they also have serious limitations. Potential problems include the condensation of moisture (in saturated gases) on the temperature detector. Such condensation will cause the thermometer to read low and can lead to corrosion. Coating or material build-up on the sensor also will inhibit heat transfer and cause the meter to read low. Additional potential sources of error include variations in the specific heat caused by changes in the gas's composition. Some common gas-flow applications for thermal mass flowmeters include combustion air measurement in large boilers, semiconductor process gas measurement, air sampling in nuclear power plants, process gas measurements in the chemical and petrochemical industries, research and development applications, gas chromatography, and filter and leak testing. While hot-wire anemometers are best suited for clean gases at low velocities, venturi meters can also be considered for some liquid (including slurry) flow applications. Thermal mass flow meters are well suited for high rangeability measurements of very low flows, but also can be used in measuring large flows such as combustion air, natural gas, or the distribution of compressed air.